Recently I was talking to a friend at church about her Thanksgiving plans and in our conversation she mentioned that half of their group of 30 people were vegan so half the meal was traditional and half was vegan. The Thanksgiving party I will be attending this year also has a couple of vegans that will be attending. Veganism is something that is becoming more and more common so I think it’s probably a great idea to bring a vegan dish to your Thanksgiving meal. I’m thinking PIE! Best case scenario: if there are any vegans attending, you are their SUPERHERO! There isn’t a better feeling when you are someone who has dietary restrictions for someone to think of you and bring something you can eat. Our little family can totally relate when we are attending a meal since my daughter has very severe food allergies to four different food very common things. I really appreciate when someone gives thought to accommodating her food needs and tries to have something she can eat with everyone else. Worst case scenario: nobody attending is vegan but you still have a delicious pie that everyone will enjoy and never know the difference. When you think of the traditional Thanksgiving meal, one of the most important components is pie. At least, that is part of the meal I really look forward to :) Pie can be tricky for vegans. Most traditional crusts are off-limits because they have a flaky, buttery crust and traditional pumpkin pie has eggs in it. Then you’ve got your cream pies like banana cream or coconut cream, which are obviously off limits because of the CREAM. I found a really yummy and EASY pie recipe that is vegan and your other guests would never know it! 1. Pour the pudding mix into a saucepan. Add the plant-based milk and stir to combine. Turn the heat up to medium and bring this mixture to a light boil. Stir frequently. **Reduce heat and continue cooking and stirring until the pudding becomes thick. 2. Remove from heat and immediately add the peanut butter and vanilla (if using) and stir until combined. If this mixture is too thick for your liking, add a little bit more plant-based milk. 3. Allow it to cool slightly and then pour into the prepared pie crust, using a spatula to get all the pudding into the pie equally distributed. 4. Refrigerate for an hour or two (or overnight) before serving. Both Jell-O Cook n Serve and Oreo Pie Crusts are vegan. **You stir constantly to help keep the pudding from getting lumpy. If your pudding happens to get lumpy (it happens), don’t be distressed. Simply put the finished pudding in a food processor or use a blender and pulse several seconds until smooth. Here are a few tips on mixing this recipe up to make it your own each time you make it. 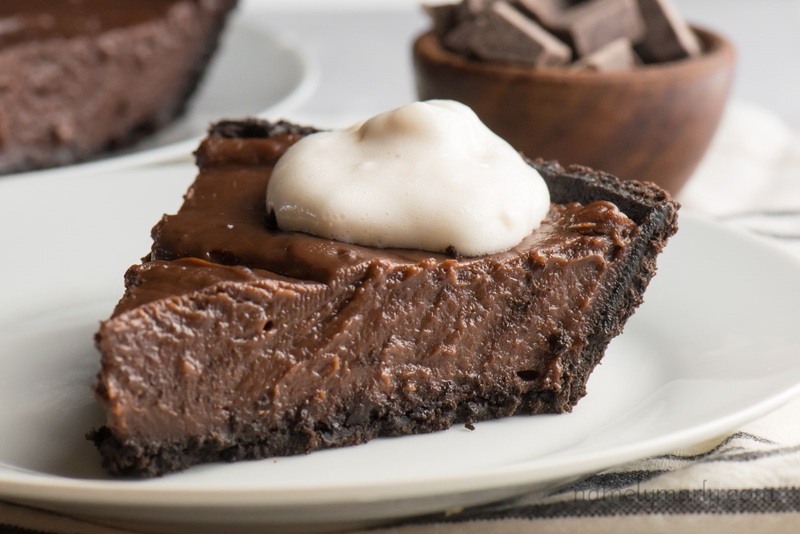 The perfect way to top this easy vegan chocolate peanut butter pie is with vegan coconut whipped cream. You can also buy vegan whipped cream at health food stores and most grocery stores.